Note: The SEN12512 is only available in a limited supply and will be discontinued after the supply is exhausted. The SEN12512 is an EasyAG probe with an SDI-12 interface and a 50-cm length. 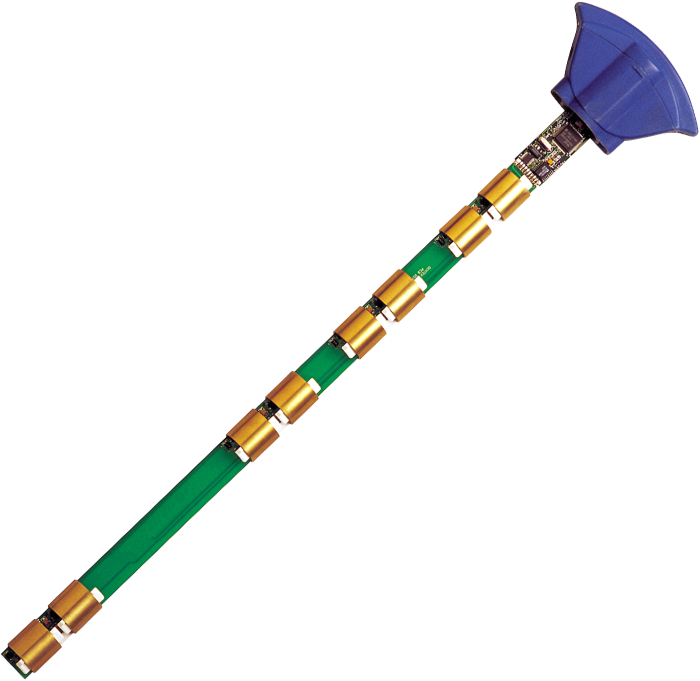 This probe provides water content profiles for cultivated soils of good tilth—commonly found in vegetable production areas. For stony soils where the average stone size is greater than 10 mm, use the EnviroSCAN probe. The SEN12512 includes several water content sensors that measure soil water at multiple depths. Around each sensor, the probe creates a high frequency electrical field that extends through the access tube into the soil. Electrical capacitance is then measured and soil water content is determined from those measurements. Each water content sensor outputs an SDI-12 signal that our CR200(X)-series, CR800, CR850, CR1000, and CR3000 dataloggers can measure. This allows the probes to be integrated with a Campbell Scientific data logger or weather station. Integrating the probes into our data acquisition systems allows the data to be telemetered back to a field station or remote computer. Sphere of Influence 99% of the reading is taken within a 10 cm radius from the outside of the access tube. What is the supply voltage for the EasyAG and EnviroSCAN interfaces? Where is there more information about Sentek products, such as the SEN12512 EasyAG Water-Content Probe or the EnviroSCAN? The Sentek website provides an FAQ list.